Good morning, friends, and happy Tuesday! My color obsession continues with a lovely little line-up of pretty place settings. 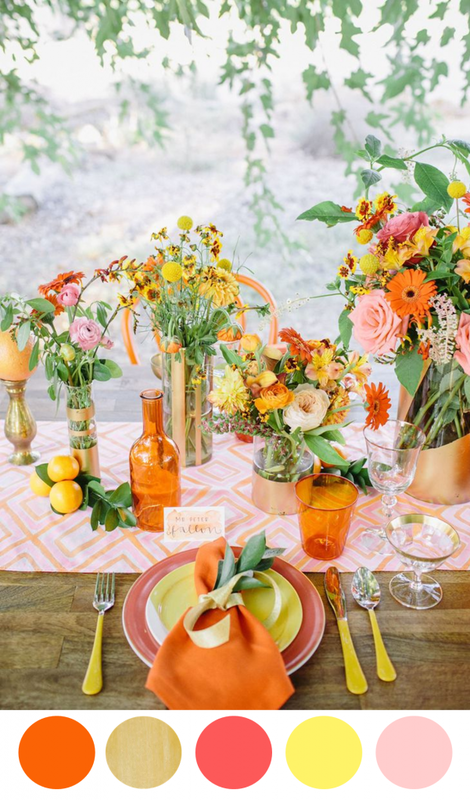 Bright, beautiful, and all kinds of inspiring, I'm really loving how these designers used color in their tablescapes. There's also a good number of creative ideas to be found! Things to be on the look out for: Painted vases, glitter votives, pretty patterned linens, creative napkin displays, and a big hand full of fun and fabulous color palette ideas! What am I loving? The layering of colors, the yellow dipped flatware, pretty place cards, and that gorgeous patterned runner! Details I love? That amazingly modern tablecloth, the bold pops of pink, and those glittery gold accents! What's catching my eye? Those gorgeous pops of pink and the way they are contrasting so nicely with solid black and grayed jade. What makes this work? Nice neutrals, like beige, make the perfect backdrop to these brighter and bolder hues. Details I love? That stemware! The layering of dishes! Those gorgeous pops of pink! What am I loving? Those honeycomb shaped place cards, that golden flatware, and this absolutely stunning set of china! What am I loving? That striped napkin, the lace detail, and that red toile china! Oh, and I can't go without mentioning the touch of burlap! I told you guys this post was full of color. And I'm not going to lie ― I'm sort of having a hard time selecting a favorite at this point. What about you? Are any of these place settings inspiring some new ideas for you? I guess for me it's definitely a toss up between the first two. There's something decidedly chic about these two. And I really love the variation of colors. So festive and fun and I love that a lot of the ideas incorporated are things you could totally DIY! 9 Comments " 8 Color Inspiring Place Settings: Bright + Beautiful "
I can never choose just one palette when you do these...they're all SO pretty! Thank goodness for you–you keep opening my eyes to fabulous new colors and palettes! I'm obsessed with all of these, but #2 and # 5 are my favorites! I love everything about that last place setting - the colors, the stripes, the lace! These are all wonderful! Loving the hot pink. A well-set table is one of my favorite things in this world!